some of you that know liza personally know that we've been concerned about her walking for a while now. the best way to describe it is that she still has a very immature walk - she very much resembles a new walker with the typical "frankenstein" toddle even though she's been walking for around 16 months. i didn't think much of it at first, but the longer it went on the more concerned i became. it's one of those things that i couldn't put my finger exactly on what the issue was, but i knew something was "off"….especially when i started to notice that she didn't run, had a difficult time climbing - even low heights like the couch or a stool - and she didn't jump. bless her heart, she thinks she is running (hence the fast arm movements and panting breaths- ha!) and she thinks she is jumping (Lord knows she gives it her best effort, but her feet never leave the ground). i felt better knowing that she understood the concepts of run, jump, climb, etc. meaning that cognitively she knows what her body is supposed to do, but physically, she just wasn't able to keep up. 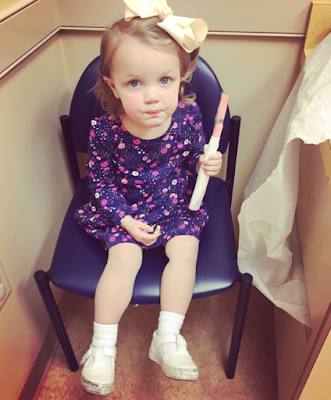 after speaking with her pediatrician, she referred us to a pediatric orthopedic to have liza evaluated and to have some X-rays done of her hips. thankfully, the X-rays did not show any bone malformations or any cause of concern. the orthopedic checked for things like clubbed feet, different lengths in her legs, hip displaysia, and other bone/growth issues. again, everything checked out. although he noticed her "different" walk, he suggested that we "give it six months" and reevaluate. at this point, i really struggled. i was so thankful that her X-rays were clear and i didn't want to "borrow trouble" so to speak. i just knew something wasn't right and i was not comfortable with giving it six months as the ortho suggested. six months from now she'd be closer to three and if she still wasn't running and jumping it would be much more noticeable. i imagine it would also effect her abilities to keep up with other children her age even more which could present a whole other set of issues. so after praying about it and talking to some trusted family members and friends, i decided to seek a second opinion. during this time, liza also began having what we referred to as "episodes" because we really didn't know what else to label them. the first time she had one, i thought she was coming down with the stomach bug. she was very pale and clammy and nauseous. it came on suddenly and i braced myself for a day full of laundry ;-) she laid herself face down on the floor and didn't move. but after about 15-20 minutes she sat up and seemed back to normal. no other signs of sickness and she was fine the remainder of the day. at the time i thought it was odd, but i was too thankful she didn't barf all over the house and spread the bug to really think there may be more to it. a few weeks later, she got really pale and clammy again and sort of "zoned out" while we were in the carpool line to pick up laney. she ended up throwing up in the car and we went straight home. she had just eaten a snack before she got sick, so again i didn't really think much of her sickness other than the fact that maybe she got carsick. but once again, she recovered after about 20 minutes and was fine the rest of the day. a few weeks later, it happened again at home - she very suddenly got pale and clammy, laid herself face down on the floor and didn't move. she was conscious, but very limp and lethargic. again after about 15-20 minutes she seemed to recover and was as good as new. at this point, i started realizing that there was more to these episodes than just a stomach bug or car sickness. it happened three more times before we were seen for a second opinion, so i made sure to make note of it and mention it to our new pediatrician. liza had her physical therapy evaluation about a month ago. she had a blast during her evaluation - ha! she enjoyed climbing, walking, playing with toys, swinging, and much more. even though she was having fun, it was difficult for me to watch. i think seeing her in that environment, attempting isolated (age appropriate) skills, and struggling to complete them really made it obvious for me that she was more delayed than i initially thought. i knew she had some difficulties climbing and moving around, but i think we'd all become accustomed to her way of doing things. 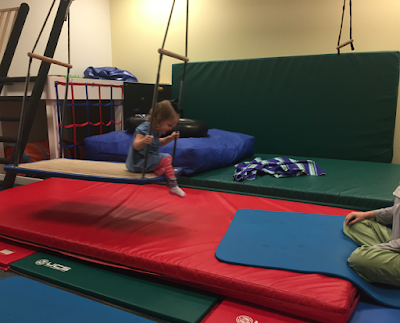 while watching liza participate in the physical therapy evaluation, it became clear to me that what we attributed to her unique way of doing things, were actually developmental weaknesses. and even though the results were pretty much what i expected, it was still not easy to hear. 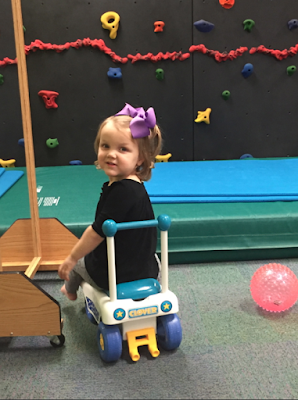 her locomotive (movement) scores placed her at an age equivalent to a 14 month old (she's 28 months). and the physical therapist suggested we have an occupational therapy evaluation to address some sensory and auditory sensitivities. so…. more appointments. 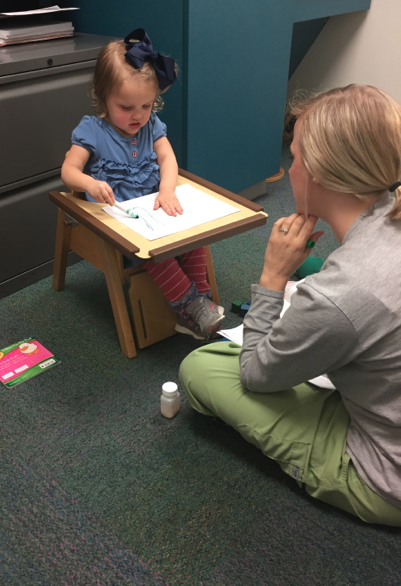 we met with the occupational therapist a few days later to have liza evaluated and again she scored below average in some of the developmental skills appropriate for her age. she presented with some auditory and visual sensitivities as well as balance and perception delays. she has a hypersensitive startle reflex - think of an infant that startles easily at a loud noise. most babies outgrow this….but liza still startles fairly easily even when she's expecting a sound (like blocks that she herself knocks over, it still startles her more than an average 2 year old). she has a difficult time with visual perception - she tends to see small steps as huge inclines. or a change in elevation is very difficult for her to maneuver. she still falls off of ledges and seats because she is unable to judge how close she is to the edge. these are just a few examples of some of the auditory and visual delays that she is experiencing. the low muscle tone and the sensory delays attribute to her lack of body awareness. this is why she drools constantly, but doesn't even realize she's drooling. she'll get upset when her shirt is wet, but she has no clue that it's wet because she's been drooling. she scratches at her skin constantly. to the point of drawing blood, but she doesn't feel it nor realize she's doing it. she's done this since she was around 6 weeks old. i always thought it was just a behavioral thing that she'd grow out of, i didn't realize that there was more to it. 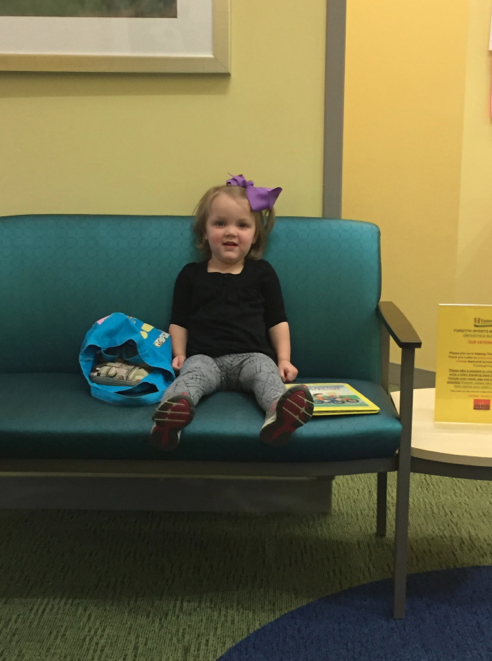 thankfully, the OT is trained to look for these things and she was able to offer some resources and educate us on sensory disorders. after her PT and OT evaluations, we had - yep, you guessed it - more doctor's appointments! 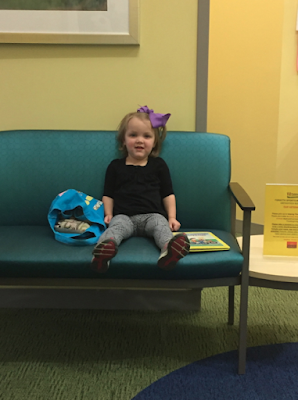 we met with the neurologist to discuss liza's "episodes" and to evaluate whether or not these were isolated incidents unrelated to her balance issues or if it could all somehow be connected. 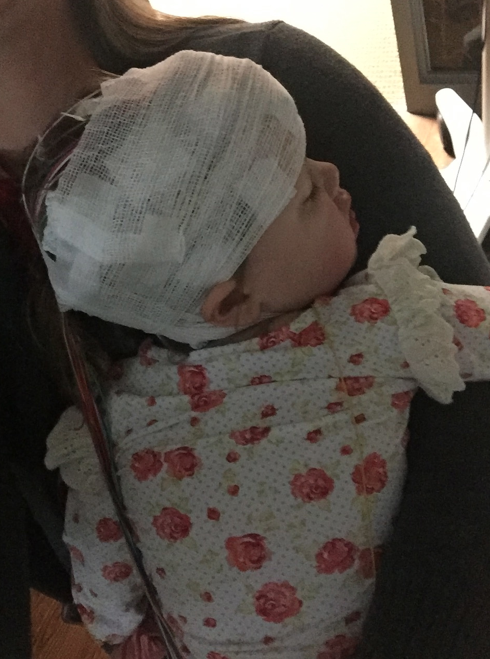 we went to the pediatric neurologist and upon observation and evaluation, they seemed to think that her "episodes" may be seizures, we just weren't sure if we were seeing the actual seizure or the after effects. 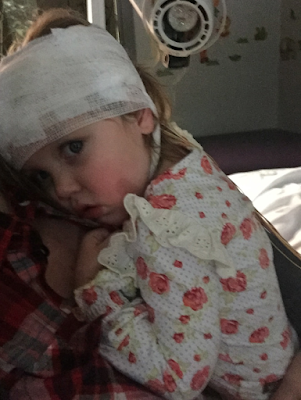 so the dr. recommended that she have an MRI as well as an EEG to look at her brain and her brain activity. which also meant….even more appointments. 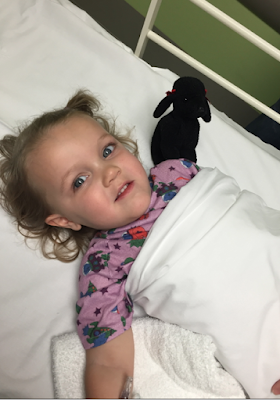 liza had her MRI the following week and did amazingly well. especially considering that she couldn't eat or drink anything beforehand and they were running hours behind (ugh!) 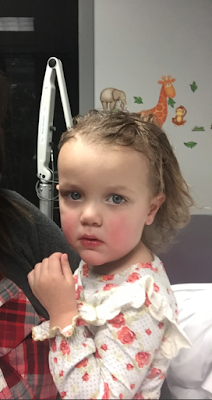 so her 10:00am MRI ended up happening at 12:30pm. ironically, she had an "episode" that morning and the nurse and jeffrey were able to see it which made me feel better since i was the only one that had witnessed it so far! 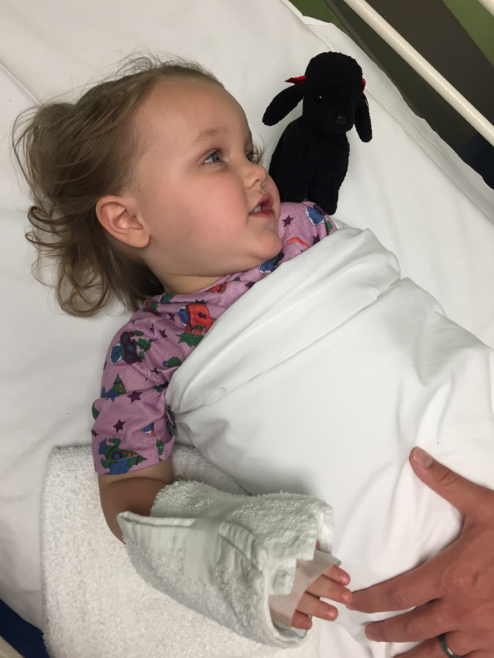 since she recovered well as she typically does, they decided to proceed with the MRI and with sedating her. 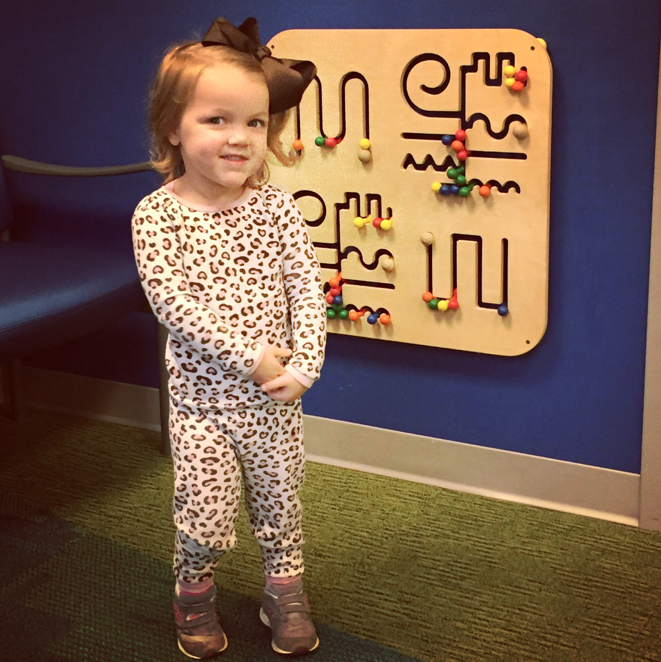 she woke up happy and we found out later that day that her MRI was normal - praise! this meant that there was not a tumor or any abnormality on her brain that would be causing the seizures and/or balance issues. we were SO thankful for the positive results. 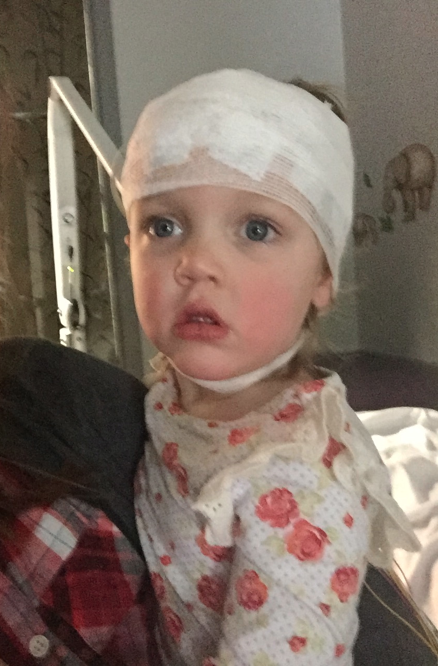 saturday morning she had her EEG to track her brain activity. i have to admit, i was prepared for the worst. 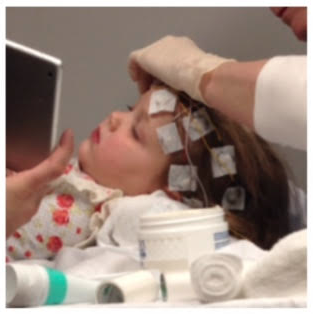 i had googled pictures of toddler EEG's and the images that came up were of children with spaghetti like wires taped to their heads. liza loves her some spaghetti, but i was 99.9% positive that she wouldn't love it coming out of her head. now it doesn't happen often (*wink*) but i have to say, i was wrong. liza girl laid perfectly still while the nurse applied the stickers to her head. she cried for a minute when the lights were turned off because she didn't want it to be dark, but then she put her head on my shoulder and snored for the next 20+ minutes. which is exactly what we wanted her to do! we woke her up when it was over, took all the stickers off her head, stuck a bow in that goopy mess of hair, and took our girl for some chips and queso. because chips and queso can solve any problem. :) we should find out the results of her EEG within the next week or so. so where are we now? well, we're still waiting for some answers as far as her seizures(?) 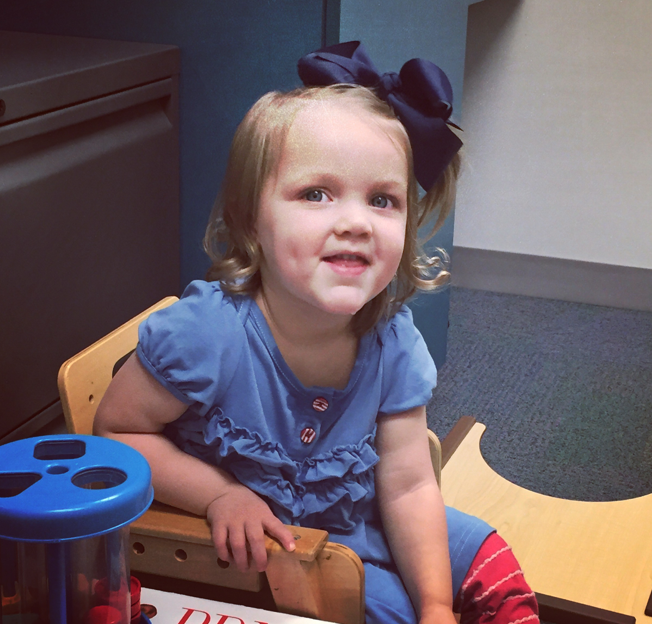 are concerned, but we have a diagnosis for her developmental and sensory delays. and more importantly, we have a game plan. :) together with her therapists and doctors, we decided that liza would benefit from one occupational therapy (OT) and one physical therapy (PT) session each week. we're about a month into PT and i can already tell that her confidence level is growing. 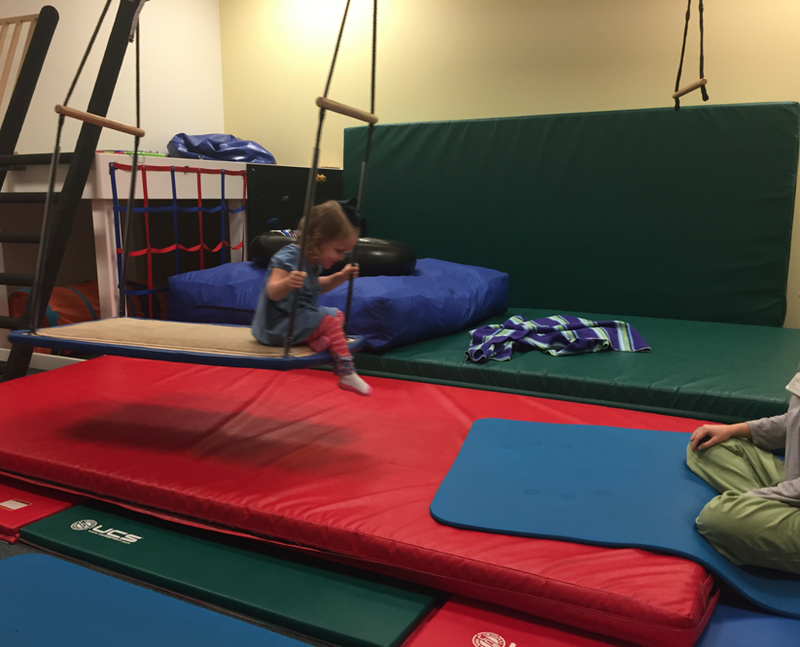 she's attempting new things and trying to practice some of the skills at home that she's learned at therapy. as hard as it is to see our liza girl struggle, we couldn't be prouder of how well she's handled all of this. everyone constantly comments on how sweet she is, and i just have to agree… because she IS! she tries her hardest at everything and follows every direction. she is pure joy. and no matter if she runs or walks, jumps or skips, she will always be our sweet liza girl. i believe whole-heartedly that liza was fearfully and wonderfully made. she was perfectly formed down to the number of hairs on her head. and there is nothing that could make me love her any more. copy and paste STMMMS42656 to receive your discount!! 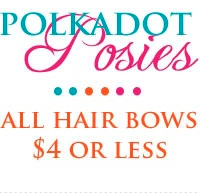 end of school year gifts (Free printables!)…. All content belongs to "www.totaltippinstakeover.blogspot.com" Please do not use without permission. Blog Design by Sweetie Baby's Blog Design, 2014. All rights reserved.